Canned Alaska salmon, arguably, is the best protein for hot weather meals. 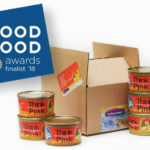 Nutritionally, what compares with Alaska salmon? Not much, if anything– maybe sardines? Sardines, however, don’t marry so well with other foods, as they like to stand alone accompanied by little more than a cracker. 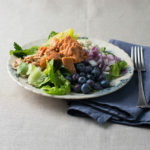 Canned Alaska salmon is a friendly food and just loves to partner up with all kinds of salads, making a summer salad a complete, delicious and very nutritious summer meal. And, did we mention, there is NO COOKING – just chop and toss and serve. Judy cautions to go light on the dressing, so the salad doesn’t lose the great ‘crunch.’ Jusy also puts this recipe together and lets it rest for 10 minutes before serving. Potato salad is another classic summer food, that when canned salmon is added, it elevates it from that yummy carb and fat rich classic to something you can eat as a main dish. I would add a little extra pickle juice or vinegar for that tang that goes so well with fish or, sliced radishes achieves the same tangy effect. Macaroni salad is nutritional kissing cousin to potato salad, and canned salmon works well in it too. Greek salad is another recipe that pares nicely with canned salmon. I use a lemon vinaigrette rather than red wine, but either works well. A green salad is a natural with canned salmon. Use your summer veggies and favorite dressing along with canned salmon and voila, here is a delicious and nutritious summer meal. I think blueberries work well with canned salmon. Blueberries and wild Alaska salmon really like each other. Blueberries grow along the salmon streams and bears eat both with great relish. Green salad with salmon is so healthy, you need to have a double dip ice cream cone afterwards to balance all that virtue. Previous Previous post: Canned Wild Alaska Salmon + Avocados; A Marriage Made in Food Heaven.